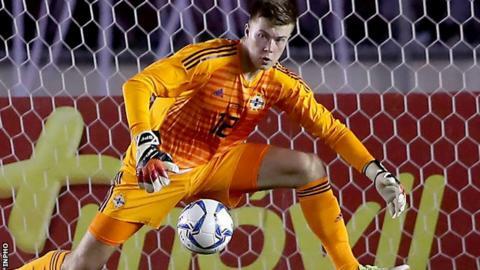 Leeds goalkeeper Bailey Peacock-Farrell has pledged his future to Northern Ireland after being sounded out to switch allegiance to England. The England-born keeper, 21, has played for Northern Ireland in a friendly. He said: "I've had several chats with the England goalkeeping coaches - one rang me the other week in fact, but I'm loyal to Northern Ireland." Peacock-Farrell is aiming for a first competitive international appearance against Bosnia-Herzegovina on Saturday. An option to switch to the World Cup semi-finalists will end if Peacock-Farrell, who qualifies for Northern Ireland through a grandparent, plays in the Nations Cup opener in Belfast. He is vying with Michael McGovern and Trevor Carson for a start in Michael O'Neill's line-up. Peacock-Farrell, born in Darlington, made his Northern Ireland debut as a substitute in June's scoreless draw with Panama in San Jose. "Northern Ireland got in really early and made me feel wanted," he added. "At that time when I met Michael [O'Neill] I was a nobody, I was just a young keeper. "But for him to take that time out of his day to come and chat to me, and tell me about Northern Ireland, the pathway and what we're planning on doing as a country, for me that was special. "I don't think you'd get that from any other international manager. That togetherness is one of the main things that Michael brings - those family-orientated values. "It's a great honour to have the opportunity to be involved with the team."